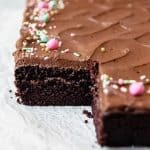 The easiest and best One-Bowl Chocolate Cake recipe is super chocolatey, light, fluffy, tender, and moist and hardly any more work than using a box cake mix. This chocolate cake made from scratch is simply the best! We have some serious chocolate cake lovers around our household. 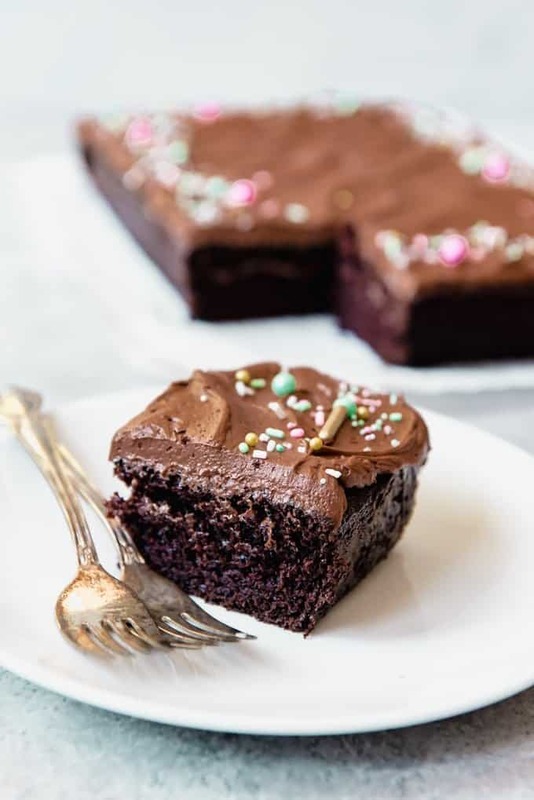 And while I have already previously shared my favorite devil’s food cake recipe that I use to make a chocolate layer cake, I wanted to share a little bit different chocolate cake recipe with you today because I use them for different situations. 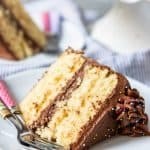 And it’s National Chocolate Cake Day, so naturally I had to get in on this with some of my blogging friends who are all sharing different chocolate cake recipes. 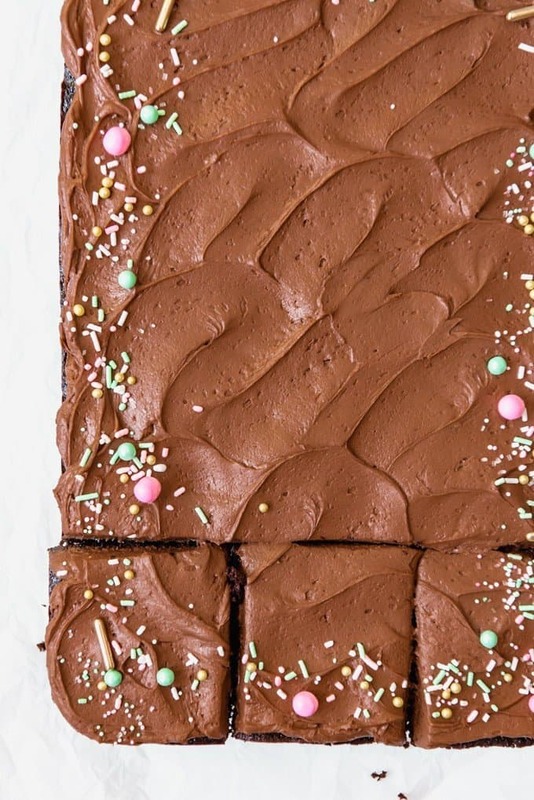 For tons of chocolate cake inspiration, scroll past the recipe to the bottom of this post. 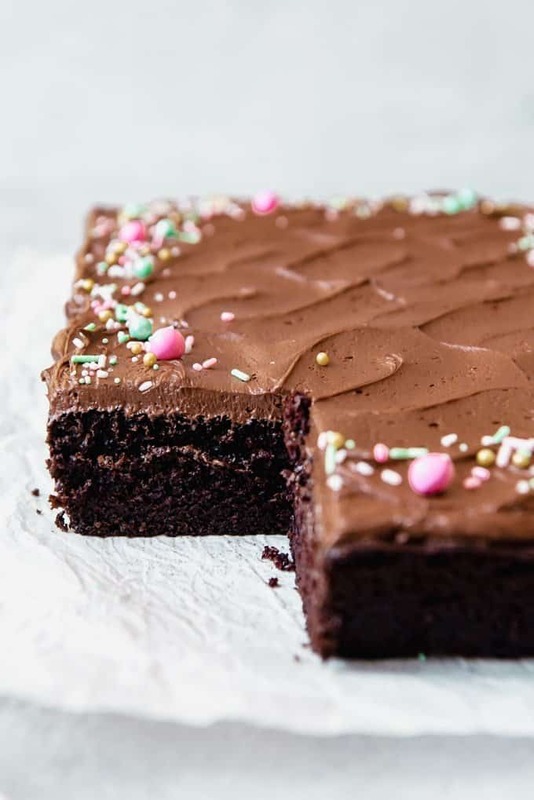 This is the best simple chocolate cake recipe ever and it comes out tasting totally amazing every time. And it’s SO incredibly easy to make. It’s also a lot like a chocolate cake mix in terms of texture, although flavor here is leaps and bounds beyond a cake mix. Although if I’m being totally transparent, I prefer the depth of flavor in my favorite devil’s food cake. 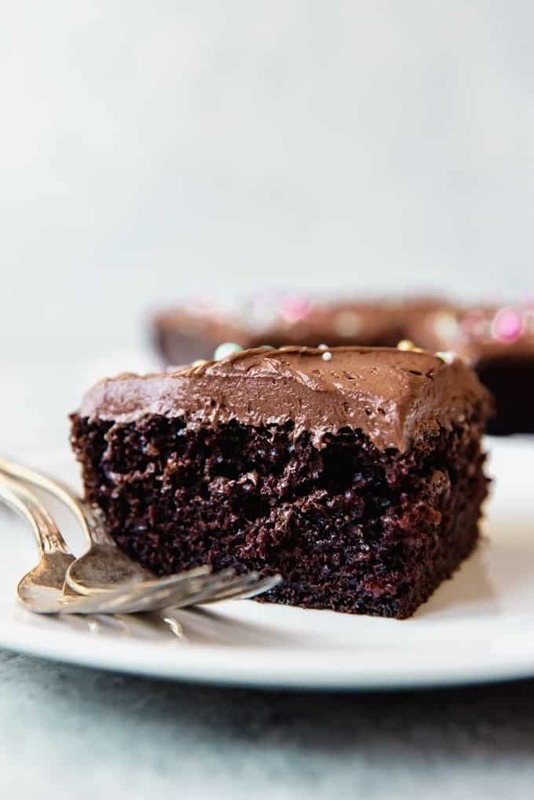 But unlike my devil’s food cake recipe, which I almost always do as a layer cake, this one-bowl chocolate cake recipe doesn’t require chopping chocolate and melting it or using multiple types of sugar. 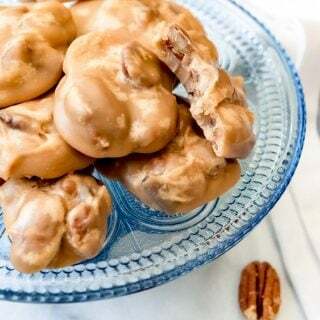 I almost always pour it into a 9×13-inch rectangular baking dish for a simple, homey presentation that also makes the process so much easier because then you don’t have to deal with frosting cake layers and making it look pretty. All you have to do its quickly slap on some frosting, spread it real fast with a knife and maybe add some pretty sprinkles (or not) and it’s time to eat cake! You can even rush things a bit and frost the cake when it’s still ever so slightly warm since you aren’t worrying about cake layers sliding off. And if some of the frosting melts into the cake a little bit, it’s no biggie with this approach. 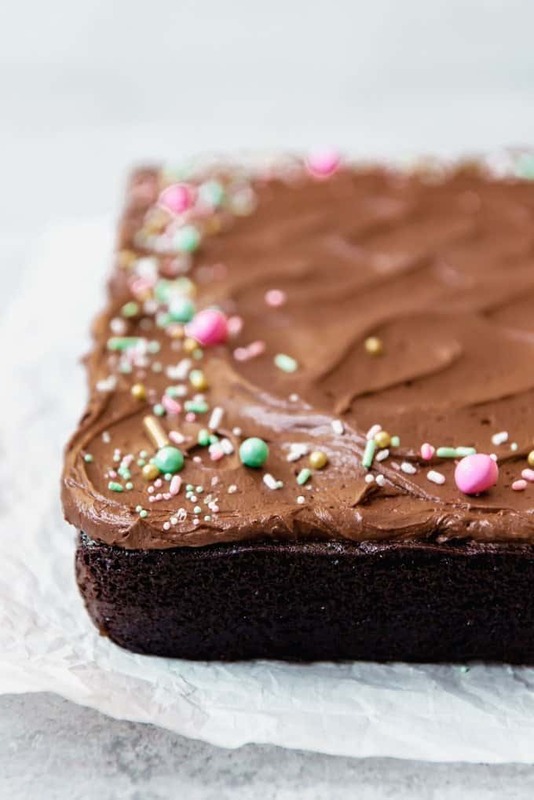 So this homemade chocolate cake recipe is definitely simpler and more straightforward. Which means you need it in your recipe arsenal for those times when you need cake ASAP! 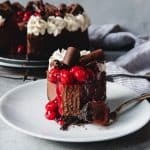 Of course, if you want to pour it into round cake pans and make a layered chocolate cake with this recipe, that totally works as well. I’ve included baking times for the different pan sizes in the recipe below. The best thing about this cake is that it can be made in about 5 minutes in one bowl. 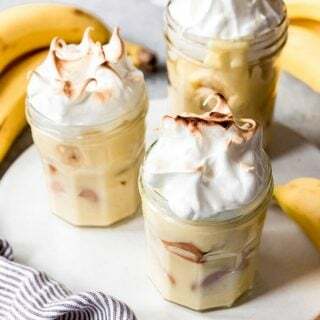 You don’t even need a stand mixer or a hand mixer, although they will definitely make it easier than just using a whisk. First whisk all the dry ingredients together in a big bowl – flour, sugar, cocoa powder, baking soda, baking powder, and salt. Add the buttermilk, oil, eggs, and vanilla and mix on medium speed using a hand mixer or stand mixer until combined. Pour in the hot water and mix until combined. The batter will be thin. 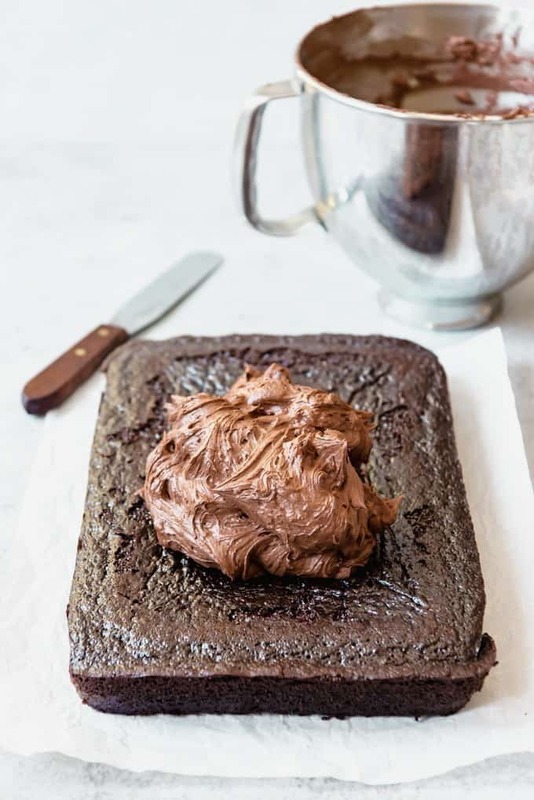 Pour into a prepared pan (or pans) and bake at 350 degrees F for 32-27 minutes for a 9×13-inch rectangular cake or 30-35 minutes for 9-inch round cake pans. 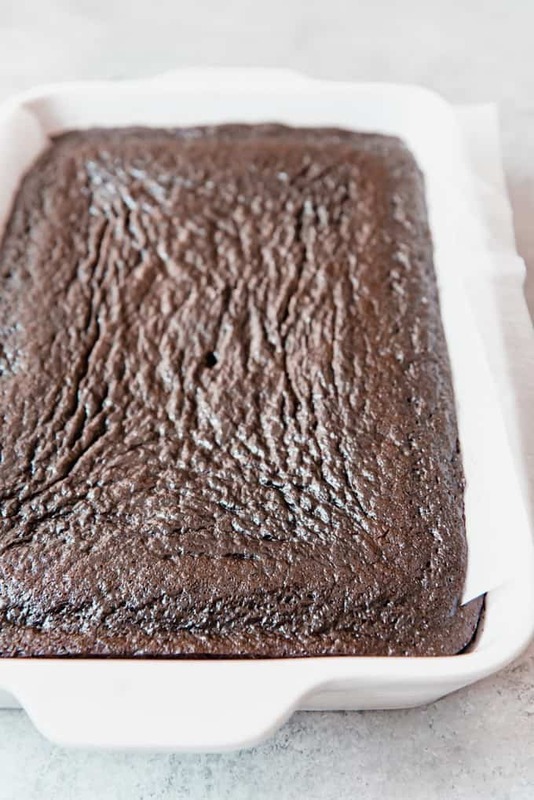 Don’t substitute butter for oil in this chocolate cake recipe. 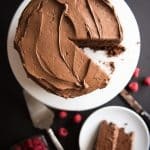 I love butter and use it regularly in my baking, but when it comes to chocolate cake, it’s oil that gives it the classic moist texture that makes it closer to a box cake mix that seems to be the standard for a lot of people. Cake flour or all-purpose flour both work interchangeably (in my opinion) in this recipe. If you have cake flour, by all means use it. If not, you honestly probably wouldn’t even be able to tell a difference using just all-purpose flour. The one sort of “special” ingredient in this cake is buttermilk. 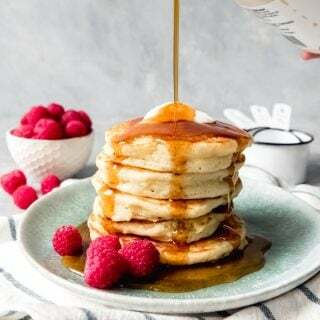 But if you don’t have any, you can make a great buttermilk substitute by adding 1 tablespoon of vinegar or lemon juice to an empty 1 cup measuring cup, then filling the measuring cup the rest of the way with milk. Stir and let sit for 5 minutes, then use in place of the buttermilk in the recipe. Be sure not to overbake your cake! Use a toothpick or sharp knife to test the center of the cake. When it comes out clean, the cake is done. Overbaking results in a dry cake and you really want a nice, moist cake with wonderful texture by baking for the proper amount of time. You may substitute coffee for the hot water in this recipe in equal amounts. Some people swear by adding coffee or espresso powder to their chocolate cakes and say that you can’t taste it but it adds depth of flavor. We don’t drink coffee so I never bother with it, but if you have it and want to use it, go for it. Rainbow Chip Frosting: The homemade kind. Or the stuff in a can, which is pretty much the only exception I make for canned frosting. Dragon Fruit Buttercream: It’s exotic and gorgeous and slightly fruity. Try it! 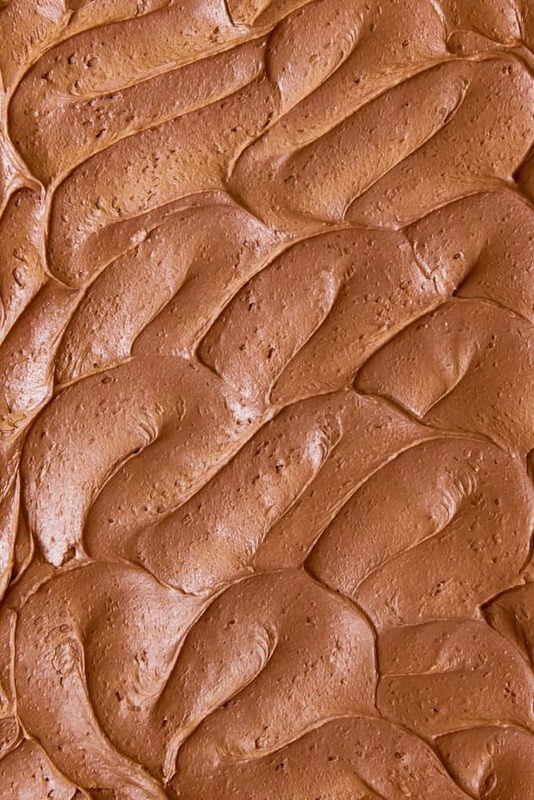 Graham Cracker Frosting: Then sprinkle with marshmallows for an easy s’mores cake! 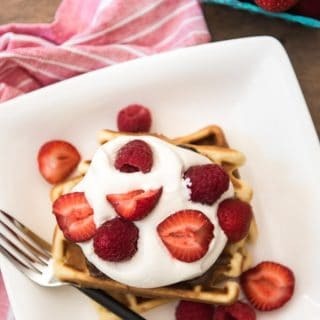 Preheat oven to 350 degrees F. Spray a 9x13-inch baking dish with cooking spray or line two 9-inch cake pans with parchment paper circles and spray sides with cooking spray. Whisk flour, sugar, cocoa powder, baking soda, baking powder, and salt together in a large bowl. Add the hot water and mix on low speed until combined. Scrape bottom and sides of the bowl and mix on medium speed for 30 seconds. Pour into the baking dish or divide evenly between cake pans. 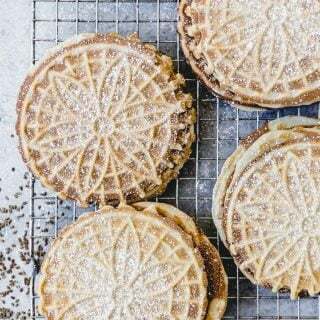 Bake for 32-37 minutes for a rectangular cake, or 30-35 minutes for 9-inch round cake pans until a toothpick inserted into the center of the cake comes out clean. In a large bowl, beat the butter, salt and cocoa powder together until creamy and smooth. 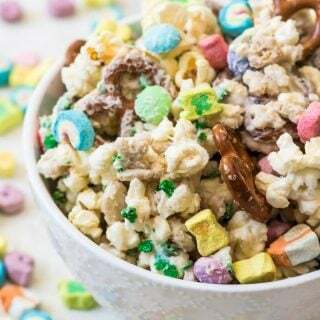 Gradually add the powdered sugar 1 cup at a time, with 1 tablespoon of the cream at a time, mixing between each addition and scraping down the sides of the bowl as needed. Add additional cream as needed and continue to beat for about 5 minutes until light and fluffy. Celebrate National Chocolate Cake Day with us! 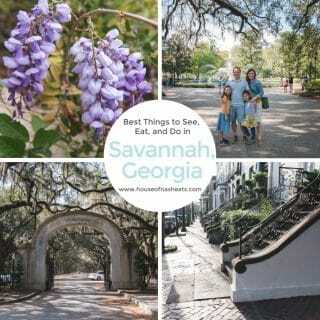 Here are some more great chocolate cake ideas from some of my food blogging friends for you! 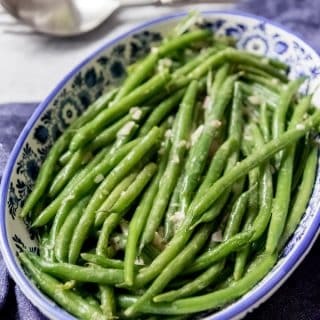 Perfect for a potluck too. Buttermilk sounds like a great addition to this batter. I agree oil is a must!